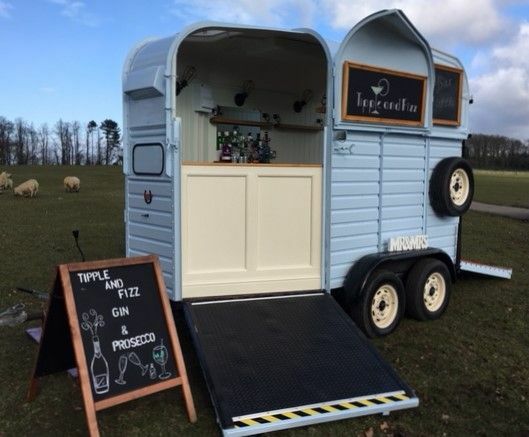 Tipple and Fizz, mobile bar solutions. 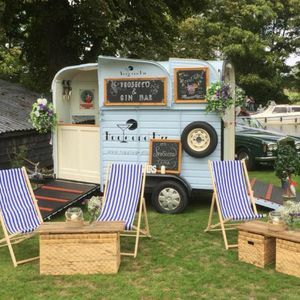 Our vintage Rice horse trailer is our beautiful horsebox bar, it has 2 serving areas and carries a full compliment of stock, however it does really like Gin and Prosecco. Or we have an illuminated bar, that is 5 meters in length, ideally for indoor occasions, it is waterproof but the stock could get wet so not ideal. There are 16 different light settings, so looks fantastic as the lights go down. . We can provide a dry bar, a cash only bar or a tab bar. Packages tailor-made. Staff, rubbish management, glassware and temporary event notice all included. Who are Tipple and Fizz? Theresa and Sam, two Sisters. 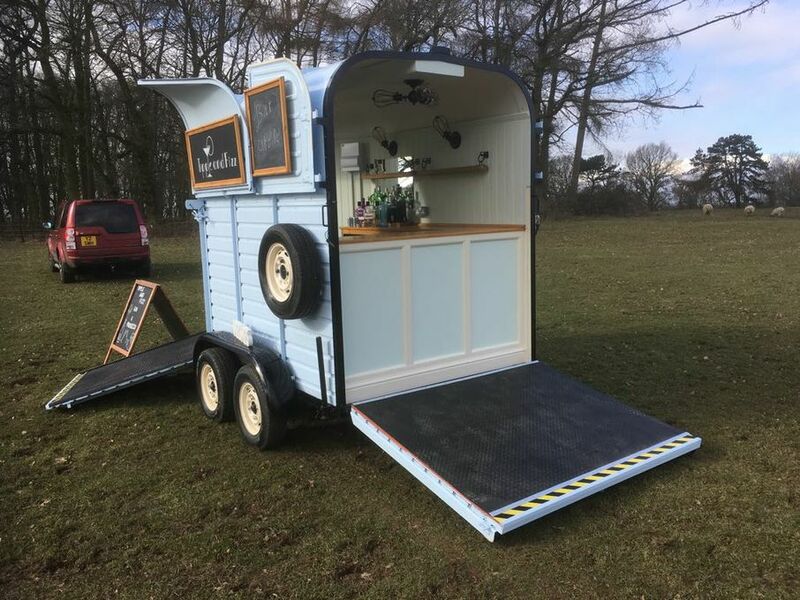 We had a horsebox for transporting the kids ponies, we found we were going to too many events that there was no provision for an alcoholic drink so decided we would take our own and set about converting the trailer. 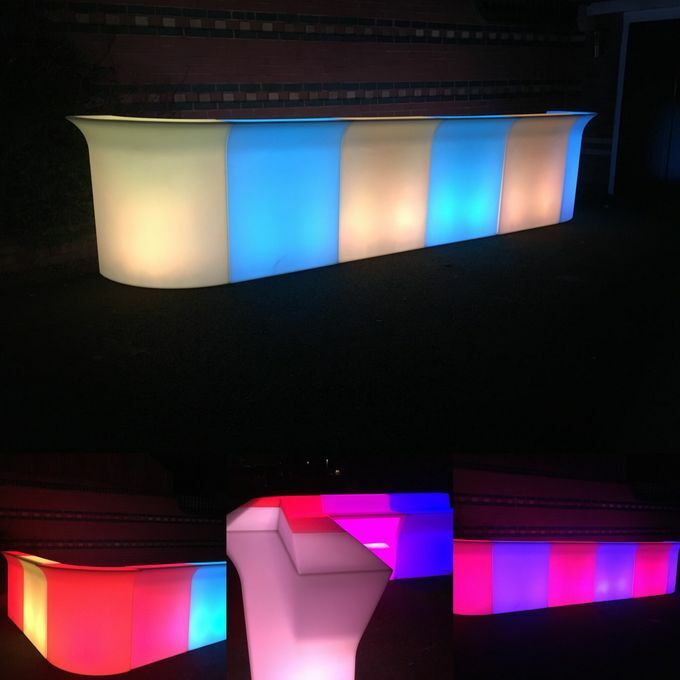 The LED bar was purchased as a result of us being asked to provide a mobile bar for indoor events. Tipple and fizz celebrated my 40th birthday with me. Fantastic service. Everyone loved them. Attention to detail makes them unique. Great selection of Gins! Would thoroughly recommend for any event. Attended an event by tipple & fizz and service was beyond fantastic and the gin cocktails were sensational! Definitely will be using again and would 100% recommend! If you live anywhere on dry land and have an event coming up you must book these guys. 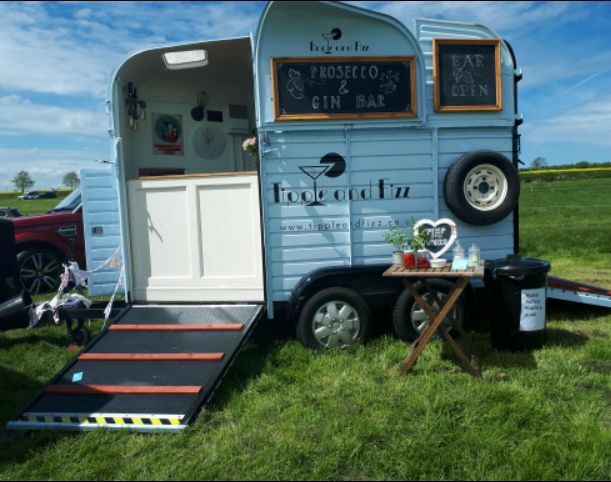 Amazing horse box and amazing drinks available. Highly recommend these guys to any event where you want people to be happy and enjoy themselves. Tipple And fizz is a locally developed project,[Leicestershire] that offers a full bar experience using artisan spirits with the very best ingredients complimented by the finest accompaniments . They offer a full mobile bar service at your venue either at home or in the public arena. 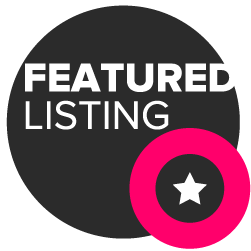 They are fully licensed and experienced in the serving various alcoholic beverages along with soft drinks where necessary. Were can you provide the bar service? The Horse Trailer is towed by a Land Rover Discovery, we will need room for access and turning for both of these vehicles. The Trailer is very suited to Fields, homes with a lot of land, carpark and areas of great space. We will do our best to create a drinks package for your needs/budget. Our main beverages are Gin and Prosecco (not Frizzente) and Peroni. Bespoke drinks package to suit all budgets. Horse Trailer Bar Fully stocked to your requirements, including refrigeration and ice. Trained and licensed staff. Disposable glasses and straws. "Pimp my prosecco". Waste disposal of all bar related rubbish/recycling. If needed, Temporary Event Notice, which allows the sale of alcohol at your event. Event organiser agrees a package in advance. Open bar, event organiser pays for their guests drinks at the end of event. First drink is on me bar, For example 50 glasses (125ml) of Prosecco with "Pimp My Prosecco" £370 (depending on location) Once 50 glasses have been reached guests then pay for their own. Cash bar, Gin and Prosecco (Not Frizzente) bar with all the trimmings or a fully stocked bar, where the guests pay with cash or card. Horse Trailer Bar and 5 meter LED bar available for private functions, weddings race meets and festivals. Standard Package from £250 depending on location and number of +18's.